ISKCON50 Congratulations from PM Justin Trudeau! ~ The Toronto Hare Krishna Temple! 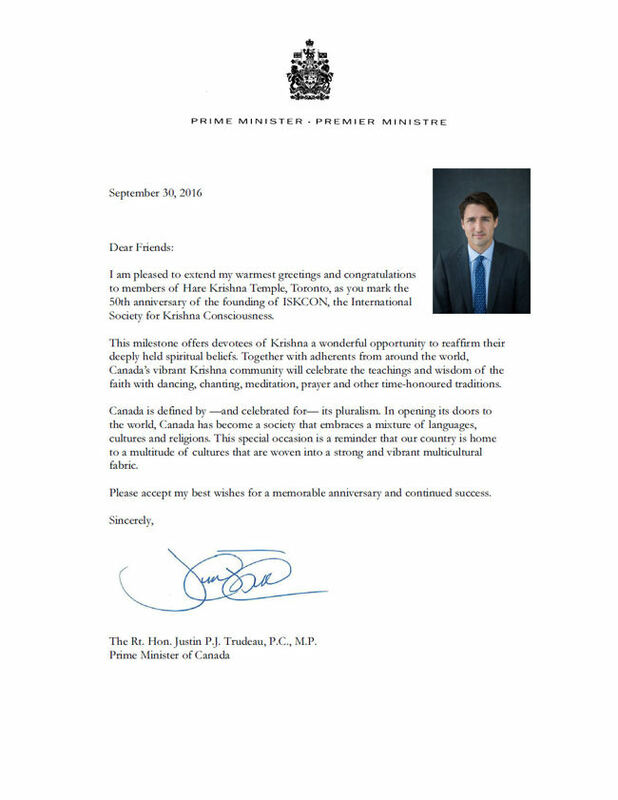 ISKCON50 Congratulations from PM Justin Trudeau! The year 2016 is a special year for Hare Krishna communities around the world as we celebrate the 50th anniversary of ISKCON, which was incorporated by our beloved founder Srila Prabhupada in 1966. Celebrations have been taking place in 600 cities across 75 countries since August 2015 and until December 2016. Here in Canada, the Right Honourable Prime Minister, Justin Trudeau has shared a congratulatory message for our Canadian Hare Krishna communities! Special thanks to one of our dynamic young devotees of our community, Preya Maulkhan for helping to coordinate the official congratulatory message from the Prime Minister's Office! Check out the message below or view the PDF here. As a member of the International Society for Krishna Consciousness, I am delighted with this hearty message of congratulations by Prime Minister Trudeau. As a Canadian citizen and the mother of a Metis child, I must express my concern that the Prime Minister express a more clear plan to support the indigenous peoples in Canada. Thank you for sharing your thoughts! Hare Krsna! Jaya Badra Prabu, I agree and share your concerns. We can only pray. And of course act and work together to make such changes possible, whenever the opportunities arise!